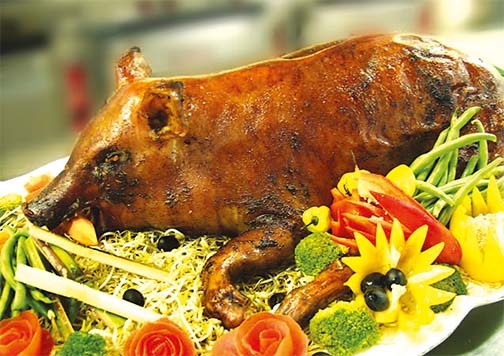 Generally roasted outdoors on fire spits, the pig is basted with sour orange juice, annatto colouring and Adobo seasoning. When the skin is crispy and bright orange, succulent pieces are carved for serving However, to make life easier, you can roast the pig in your oven. 1 teaspoon Adobo seasoning, or seasoning of choice. Wash and prepare suckling pig. Baste with mixture of sour orange juice, annatto andAdobe. Place in pre-heated oven at 350 degrees F and bake for about 20 minutes per pound. Do not allow to overcook. If desired,the pig can also be stuffed, using a basic stuffing recipe to fill the cavity before roasting. Grind the garlic in a mortar, slowly adding the de-seeded hot pepper and olive oil to make a paste. Place into a clean jar, add other ingredients and stir well. Let stand for about an hour before serving.